Two new studies reveal the importance of silviculture for increasing farmers’ incomes in Java and East Nusa Tenggara, Indonesia. Planting timber in agricultural systems is a common practice in Indonesia. Farmers often cultivate timber together with other crops to diversify and increase their income. Timber acts as a savings bank: only harvested when large funds are needed. To ensure the best growth of timber, experts recommend that farmers practise silvicultural techniques, which, despite the numerous benefits, are still not widely adopted. In Gunung Kidul in the province of Yogyakarta and in Sumbawa and South-central Timor in East Nusa Tenggara province, researchers in the Developing and Promoting Market-based Agroforestry Options and Integrated Landscape Management for Smallholder Forestry in Indonesia project explored the factors that encouraged farmers to adopt silvicultural techniques. Their findings have been published in Agroforestry Systems: Adoption of silvicultural practices in smallholder timber and NTFPs production systems in Indonesia. The project is funded by the Australian Centre for International Agricultural Research. ‘At the research sites, timber and non-timber forest products contributed significantly to the economy,’ said Gerhard Manurung, the research leader and agroforestry scientist with the World Agroforestry Centre in Indonesia. ‘We found that the most important factors affecting whether farmers would use silvicultural techniques or not were ease of access to the knowledge found in forestry extension services and farmers’ groups, how well they understood government policies on timber and non-timber forest products, the number of land parcels held by each farmer, and the number of tree and other species that the farmer managed’. He pointed out that most available research on silvicultural practices was usually done in the context of natural forests whereas this study offered a fresh perspective because it focused on agroforestry systems, that is, trees on farms. Silviculture helps farmers to develop more productive systems and reap greater benefits. 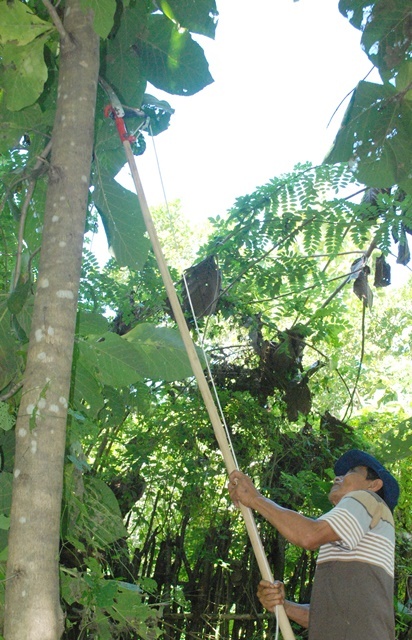 For example, pruning leads to knot-free timber, which attracts premium prices; thinning young trees so that the remaining trees do not have as much competition for light and nutrients generates the highest percentage of heartwood volume, meaning bigger trees for harvest and more timber to sell; and intercropping teak with nitrogen-fixing shrubs helps to increase the trees’ diameter while at the same time improving soil conditions, which facilitates faster and stronger growth and bigger trees. Timber and non-timber forest products contributed more than 60% to household incomes at the three sites, which was greater than that from agricultural and plantation crops, yet adoption of silviculture remained low. The researchers found that lack of resources and access to information stopped farmers from adopting better practices. 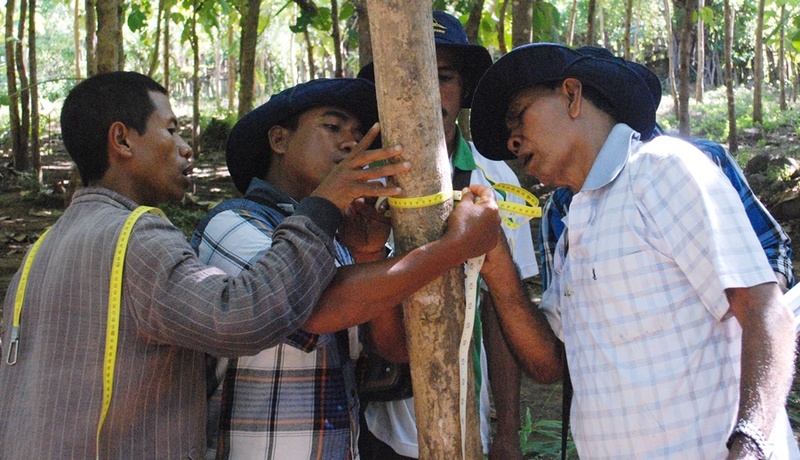 In Sumbawa and South-central Timor, when there was more access to forestry extension services and farmers’ groups where knowledge was exchanged, the likelihood of farmers adopting better silvicultural practices rose 2–4 times. The researchers recommended that policy makers, researchers and extension providers should collaborate more robustly, using approaches that put farmers’ livelihoods at the forefront. Research and training should incorporate participatory techniques, which are renowned for their success in fostering problem-solving skills and speeding learning. Additionally, government research centres should provide on-farm support, such as demonstration plots, that allowed farmers to observe changes brought about by improved techniques. In terms of policies, the researchers proposed that governments encourage intensification of smallholders’ tree products through intercropping, which escalates the rate of adoption. Regulations on the sale of tree products should be simplified and information provided about grading and pricing mechanisms. The other study, The significance of planted teak for smallholder farmers, focused on Gunung Kidul, where teak is a valuable investment and an important part of cultural heritage. When grown together with other commercial crops, teak agroforestry systems in Gunung Kidul contributed 40% of household income. Typically, teak produced by smallholders has a diameter of 30 cm, which is considered sub-optimal by the industries in Jepara in Central Java that produce much of the nations’ teak furniture. Thinning trees helps to improve the size and quality of those that remain but often farmers are unwilling to thin because they fear they will lose income. Also, most farmers use wildlings, sourced from forests or natural regrowth on farms, instead of high-quality seedlings or seeds produced in nurseries. Wildlings typically do not grow as well as those produced by skilled nursery operators. In Indonesia, the value chain for teak consists of smallholders, local traders, wholesalers and processors. Farmers typically sell logs at prices based on information from other farmers. There is a general lack of knowledge about market prices and grading systems, resulting in sales often below market value. Because traders bear the major risk in the transaction, they lower their offers to farmers so as to cover the cost of the risk. Echoing Manurung and team’s findings, the researchers recommended the use of on-farm trials as a way of stimulating farmers’ interest in improvements. Further, silviculture needed to be aligned with farmers’ needs for short-, medium- and long-term income. For example, by thinning trees farmers could plant short-rotation tree species, which could be harvested in 5–8 years, in-between the teak. The researchers also urged the development of ‘win-win’ partnerships between farmers and industry, with governments providing incentives and simplifying timber regulations. Information about price and quality needed to be widely disseminated along with silvicultural extension programs. Research centres and industries could provide access to high-quality seeds and seedlings. Sabastian G, Yumn A, Roshetko JM, Manalu P, Martini E, Perdana A. 2017. Adoption of silvicultural practices in smallholder timber and NTFPs production systems in Indonesia. Agroforestry Systems. DOI: 10.1007/s10457-017-0155-9. Roshetko, JM, Perdana A. 2017. The significance of planted teak for smallholder farmers. In: Kolbert W, Kleine M, eds. The global teak study: analysis, evaluation and future potential of teak resources. IUFRO World Series Vol. 36. Vienna, Austria: International Union of Forestry Research Organizations. pp. 66–70.